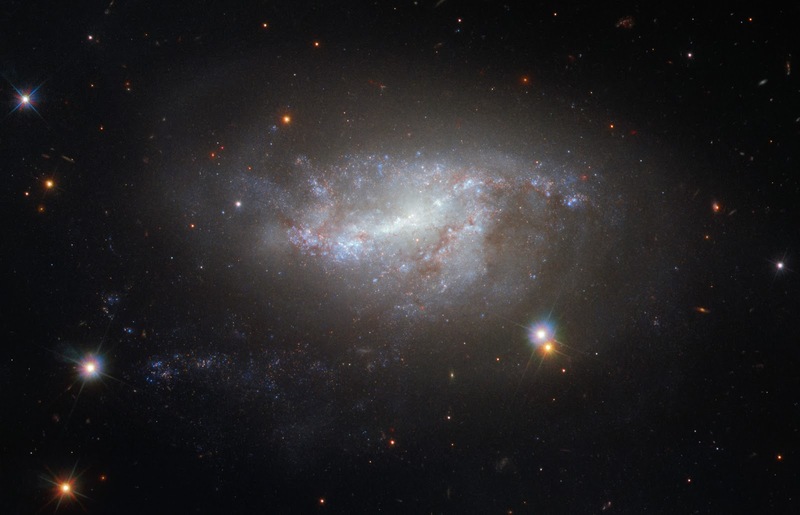 This image from Hubble’s Wide Field Camera 3 (WFC3) shows a spiral galaxy NGC 5917, perhaps best known for its intriguing interactions with its neighboring galaxy MCG-01-39-003 (not visible here, but located off the bottom right of the frame—as seen here). Mass is often confused with weight, but they are very different things. Mass is the very substance of an object and is something one always has, no matter the location. If you fly to the Moon and experience low-gravity conditions, your mass has not changed at all. What has actually changed is your weight, because weight is a force caused by the gravitational attraction of another massive body. Gravity is how objects with mass “talk” to one another. People do weigh less on the Moon, but not because they have lost any body mass—the mass of the Moon is less than that of the Earth, so it exerts a smaller gravitational pull on them. Understanding mass is vital when it comes to understanding why objects behave the way they do in space. Without mass “talking” via gravity, the planets would not orbit the Sun, and galaxies would not interact as NGC 5917 does with its neighbor. Galaxy interactions can lead to very interesting effects; the galaxies can steal mass—in form of stars, dust and gas—from one another, distort and warp one another’s shape, or trigger immense waves of new star formation. Sometimes, a galactic duo interact so strongly that they end up colliding and merging completely. Unfortunately, if NGC 5917 is destined to merge with its celestial neighbour, it will happen much too far into the future for us to enjoy the spectacle.